A study by the University of Reading and Oxford Brookes University found that e-bikes can boost the cognitive function, mental health and general wellbeing of cyclists between the ages of 50 and 83. 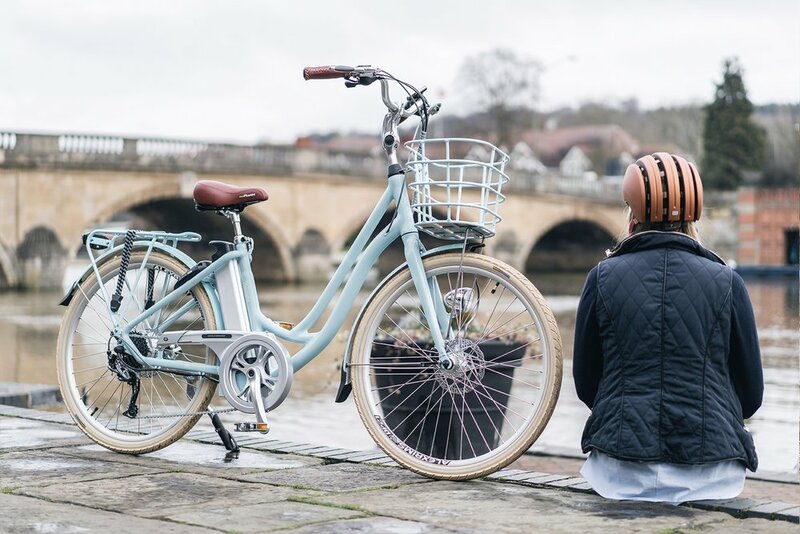 VOLT is the leading UK manufacturer of electric bikes, producing stylish and affordable electric bikes, equipped with one of the most sophisticated and reliable e-bike systems – making eco-friendly travel more accessible to people of all fitness levels. Since giving up my car a year ago, I've been looking for other ways to travel around and I couldn't wait to test the VOLT Kensington electric bike. First impressions when it arrived: it looked really stylish, with its pastel blue frame, leather seat and handlebars, pannier rack and front basket. The step through design meant it was easy to get on, and I liked the upright handlebars which let me look at the views as I cycled. The battery sits below the saddle and you switch it on there, then touch a fob key to the small screen on the left handlebar. The screen displays the level of power assistance you've chosen, the remaining battery life and your speed as you cycle. The bike also has 8-speed Shimano gears, easily worked up and down by two levers on the right handlebar. I'd never ridden an e-bike before and I was a bit worried it might feel out of control – but it never did. The Kensington has five power options – off, low, normal, high and power – selected by using up and down arrow buttons beside the screen, easily reached with a thumb from the left handlebar grip as you cycle. I started off in low power mode and the assist came in smoothly and gently, just as if my legs were getting a little extra boost. As I grew more confident I tried more powerful modes and was soon happy switching between them as needed, and sometimes hitting the top assisted speed. E-bikes are legally limited to 15.5mph; you can go faster than that, as I did down a big hill, but the power assist cuts out. I found the up and down buttons occasionally took a second, firmer press to change the power level successfully, but overall it couldn't have been easier to use. I live in rolling countryside, rather than mountainous, but the Kensington tackled all the hills I could find with no trouble at all and I never got out of breath. It felt like good exercise for my legs, but I didn't arrive at work, or the shops, or lunch with friends in need of a shower! It was also handy for hill starts which can be tricky on regular bikes. As soon as your first foot goes down, the power comes in, giving you enough of a boost to get the second foot onto the pedal and away. A howling headwind was no trouble for the bike either, although I could see from the display that it was running down the battery. The Panasonic lithium ion battery can be charged at any regular socket, either while it's in-situ on the bike, or you can unlock and remove it to charge it separately (although you do need to remove the quick-release saddle first). It takes 3-4 hours from flat to full charge, and the range is up to 60 miles. I never got close to running it out, but it depends on how much you use the motor, and how hilly and breezy your ride is. Like all e-bikes, the Kensington is heavier than a regular pushbike. This model weighs 25.7kg with battery, but I only noticed it when trying to manoeuvre it round a tight corner into my bike shed. A small lever on the handlebar engages a walk assist mode which moves the bike along at walking pace – up to 4mph – if you need to push it (and the lever also gives a quick boost if you press it when cycling). Once I was on the bike I didn't notice the weight: it just felt like a very stable ride. The bike comes fitted with lights which run from the main battery, and the suspension on the saddle can be adjusted for a firmer or softer ride. The bike is available in two sizes, 15" or 17", so you can get the right fit, and it's also available in cream and Kensington green. The VOLT Kensington electric bike is a great eco-friendly option, easy and really fun to ride. I returned the test bike a couple of days ago and I miss it already.